Mammoth Summer 2015 - Mountain biking? Smoke!? No motorcycling to speak of this summer, due to a heavy work schedule. Sometimes 70 hrs a week heavy. So I saw a mountain bike for sale across the street from Von's and picked it up for $150 cash. Hardtail Rockhopper with a front suspension. Everything works great except for a slow to engage back brake. I depart sans helmet, off into the smokey air of Mammoth Lakes to pedal around, running errands and sniffing out single track. So what is up with mountain biking in Mammoth? For me it started with our youngest taking his clapped-out Cast Off special on every neighborhood footpath he knew. From "no trespassing" signs to yelled warnings, he brought life to secret single tracks. He even discovered the past president's, Fro-Dough, apocalypse bail-out moto trail which is barely visible to the naked eye. No matter what you run, skinny tires, fat tires, or the spare tire around your waistline, Mammoth's dirt seems more tailored to motorized -- deep and dry, volcanic and sandy. So who has the advantage when motorized and non-motorized share the same path? But don't call me jaded yet! Below are the top 5 things I learned about mountain biking in Mammoth. You'll notice I said "in Mammoth". Mammoth is the Town of Mammoth Lakes and surrounds, not Mammoth Mountain or their pay to ride bike park. 1. Prepare yourself to get run-over in Town. Nothing beats jumping curbs, snaking between landscape boulders or cutting condo common areas on the way to the Post Office. However, the 4-wheeled populace has blinders on, mostly to bikes and pedestrians, but sometimes just in general while waiting upon the next text. Beware. 2. There's not a lot of good Mammoth dirt. By good dirt I mean hard packed trails that hug the topography. With a little use everything seems to turn loose and mushy with cotton-mouth sand. Large running groups can pock mark flowing trails in a matter of seconds. 3. 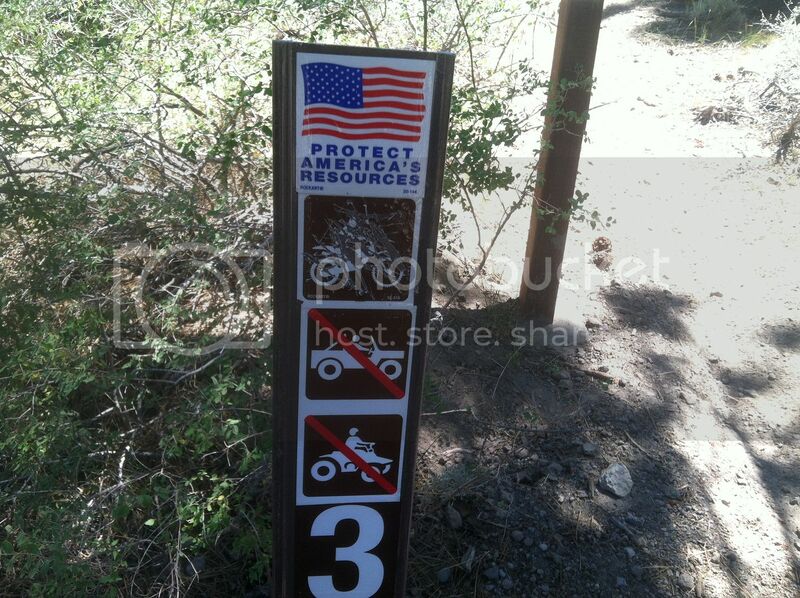 Around town, when a trail is multiple use, non-motorized loses. Except for one exception, I'll get to later. I rode part of the Knolls Trail where it was overlaid with the "Mammoth to June" OHV super highway. That section has seen an explosion in use followed by the typical "no maintenance" approach. I get it, we should be happy enough the route was signed for OHV, that was years of desk work in the making. Years! Now who's going to maintain, no glamour in that. 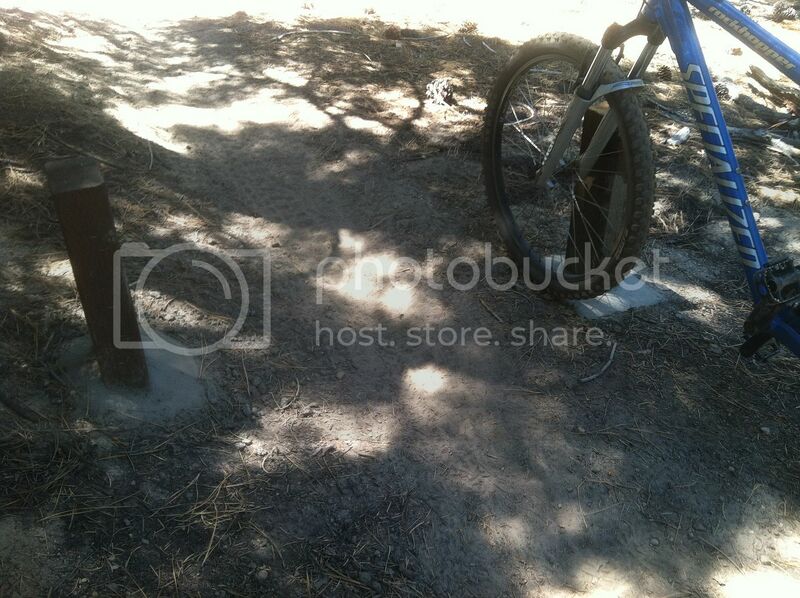 Anyhow, I found the route to be un-rideable by mountain bike. Deep ruts, loose baby heads (rocks), and a dry powdery surface that turned my new Aasics a dull grey as I pushed the bike 1/2 mile uphill. Extreme hiking trails. No longer a Griffith Park phenomenon, these trails cater to "skilled" hikers and go where mountain bike and motorized single track can't. Extreme hikers and trail runners require at least 50 miles of rugged trail looping all around town to challenge themselves - it's cool to see it slowly burning in. Abandoned super secret downhill mountain bike jump/jib courses. These things are awesome but crumbling away. During extended droughts earth packed berms and features give way to gravity leaving what looks like a giant segmented sand luge that everyone avoids, even motorized. Barricades. Yes, it was a first for me to discover barricades built to preserve motorcycle trail! I noticed. My only criticism would be that they were built too wide, you could fit a couple bikes or motorcycles through side by side. This section of trail, named after cut-throat San Joaquin Jim, is the exception to the rule of motorized and non-motorized being able to use the same path. It still flows great on bike, Joaquin Jim might spare your scalp, it's that good. Single track protection - needs one more post smack dab in the middle. At least cinch it up!! 5. No people. Similar to dirt biking this can be my favorite part. Keel over from a sand induced heart attack and it could be days until your body is recovered. I ride undercover, like a cap wearing long hair riding a mountain bike in search of drugs (can't afford a car). Don't fear me, it's just my preference to blend in with the rest of the forest riff-raff. When I quietly roll up on illegal forest dealings, no one is the wiser! Moving on, there are other notable things to see via bike around town like a super secret single track connecting the Town Offices to Roberto's, when you are in need of a quick lunch special fix, pump tracks out in back of Schat's bakkery, to a sweet down hill jump trail connecting Mammoth Brewing to the heart of the Ghetto, and even a new section of paved trail skirting a 12' drop-off (aka night time municipal booby trap) in the Brother's Skate Park. I even came across a terrain park someone built out of lumber above Mill Creek in Old Mammoth -- but that was years ago. Regardless, it is all there to those that look. 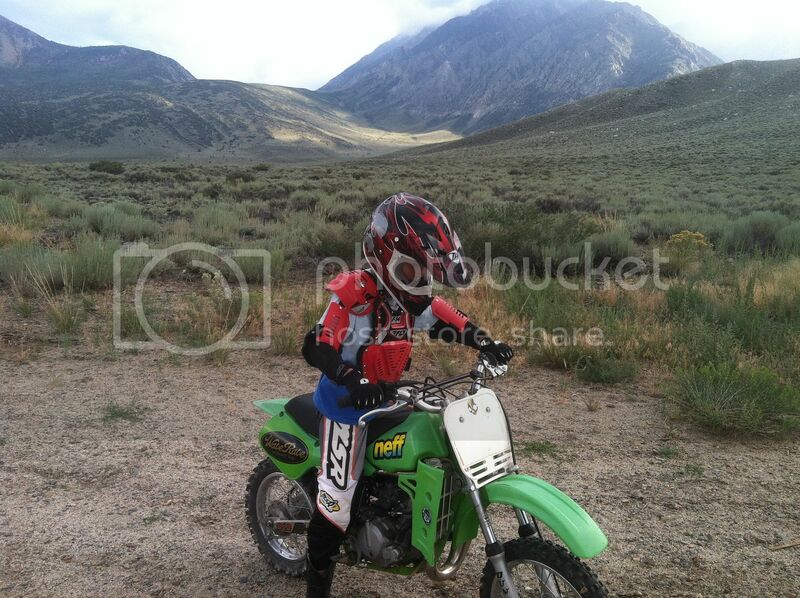 If you are used to riding a dirt bike it will feel like poaching, but it's not. In conclusion, mountain biking around Mammoth is fun and probably counts as exercise - but when the smoke leaves I hope I don't go through cigarette like withdrawals. Better: motorized and non-motorized lets get together and make San Joaquin Jim proud! And scratch out the motorcyclists! "Hi Tony, this is Sixto Fernandez calling for some information. There seems to be some confusion over at the Inyo National Forest to who holds the OHV permit out at the Mammoth Motocross. They said you did." "Me?" I replied, "No, at one time I think we were talking about it, but I'm pretty sure that Mammoth Mountain Ski Area holds the permit, let me get back to you on a definite answer." Sixto was agreeable to my response but added that he thought the track should be open on a seasonal basis to the public. (that brought me back 5 years!) It's there sitting empty and we have grant funds that could be used to staff and maintain it -- you should come to a September meeting in Mammoth, because we're planning a field trip to the facility and will be discussing options. Well. I hung up with Sixto and thought about what he said, sounds very reasonable. The problem being, we've thrown reasonable solutions around the Mammoth Motocross Track for almost a decade and there's always a reason why it can't be done. Now you can call me jaded. 2 out of 4 isn't that bad! Past president Jason Vorhees joined me to butcher some cows one late night at the ball fields. Everyone was happy, the hospital brought out a keg of beer and the good times flowed for about 1 hour and 15 minutes, then the keg went dry. Everyone woke up the next day and went back to work. The summer in Mammoth Lakes is ending on a smoke filled note. One guest to the area told me he "felt like a smoked salmon". You get the picture. Well this day at the Post Office was windy, smokey and cold, which is better than smokey and hot. In my hand I clutched a $2000 mortgage payment in a stamped envelope. I drove up to the outside bin that has an elongated collector so you can handily pass your envelope down the chute and it's on the way. So what do you think happened? The damn cold smokey wind pulled the envelope out of the chute and flung it under the car! Fucksticks!@! Didn't really say that, but thought it. Then to my horror when I peered under the car the letter was gone. A quick scan shows me the letter is flying across the Post Office parking lot, people and cars everywhere. I run it down with no problems, car left idling in front of the mail box. On the way back I notice a shadowy figure on an interception course and he meets me at the back bumper. "You recognize me?" He asks, then mentions his name. I don't recognize him at all, but say I do. "We used to exchange emails about a certain single track that was closed to wilderness..." he continues, "Do you know there is a website with information on repealing wilderness?" Then it all comes back, and I know who I am talking to. I'm not going to get into it here, but it should know that many of us take it personally (like a core shot) when we are closed out of our old stomping grounds. We live here for a reason, and there are many of us that may/could/will turn renegade. Howler or Hunter, everyone reaches their tipping point. Well, maybe some of us rode this summer.